The Country Music Association celebrated members of the national and international media this week while they were in town for the CMA Awards. Receiving trophies were PEOPLE’s Cynthia Sanz and BBC Radio 2’s Al Booth. Veteran print journalist Cynthia Sanz, Assistant Managing Editor for PEOPLE, received the 2009 CMA Media Achievement Award during the CMA Awards Media-Publicist Brunch on Awards day (11/11). 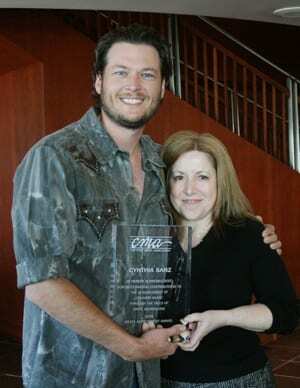 On hand to present the trophy was Warner Bros. recording artist Blake Shelton. 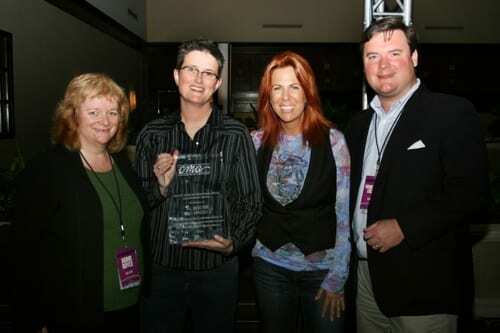 BBC Radio 2 Executive Producer Al Booth was surprised at this week’s CMA International Media Reception when she was presented with the 2009 Wesley Rose International Media Achievement Award. A lifelong Country Music fan, Booth is the Country Music specialist at the United Kingdom’s most popular radio station BBC Radio 2, with a weekly reach of nearly 13.5 million listeners. (L-R) CMA International Consultant Bobbi Boyce, Booth, CMA Board Member Victoria Shaw, and CMA Senior Manager of Membership & Industry Relations Hank Adam Locklin.